(AP) - Fears of a catastrophic flood eased Saturday with word that the Red River apparently crested at lower-than-expected levels, and weary residents in the area turned their attention to ensuring their hastily built levees hold up against an onslaught of ice-laden water expected to stay high for at least a week. National Weather Service meteorologist Mike Hudson said the Red River began receding Saturday morning, surprising residents who were bracing for a crest on Sunday. But the river can still fluctuate up to a foot and may remain at dangerous levels for a week, meaning people will still have to wait several days before they are completely safe. "The best news we can take from this is the river has crested," Fargo Mayor Dennis Walaker said. "But diligence is going to have to be required for at least eight more days and hopefully things will continue to drop." Forecasters say the river is retreating because cold temperatures have been freezing water that normally would be flowing into the river. 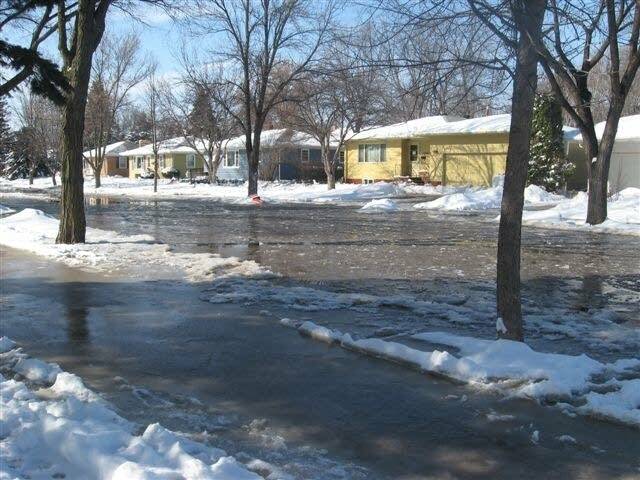 By the time that water thaws, the biggest flooding threat should have passed, Hudson said. The weather service said the river crested around midnight at 40.82 feet. As of 5:15 p.m., it had dropped to 40.53 feet, a significant shift from earlier forecasts that predicted the river would crest as high as 43 feet -- the same level as the dikes protecting Fargo. Despite the revised forecast, officials did not back down in their efforts to fend off the floodwaters, deploying high-tech Predator drone aircraft, calling up more National Guard troops and asking residents to form neighborhood dike patrols to look for any breaches in levees. Walaker and other officials have made it clear that they welcomed the extra help from residents to monitor the sandbag dikes hastily assembled to protect his city of 92,000 -- while remaining confident that residents could make it out of town at the last minute if they had to. "It's critically important that we're vigilant in inspecting those levees to ensure they're stable," said city engineer Mark Bittner. 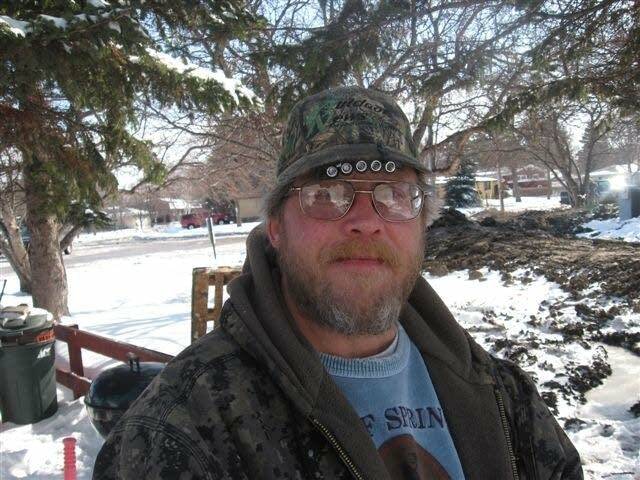 "We encourage neighborhoods to get together and have their own dike patrols and assist us." 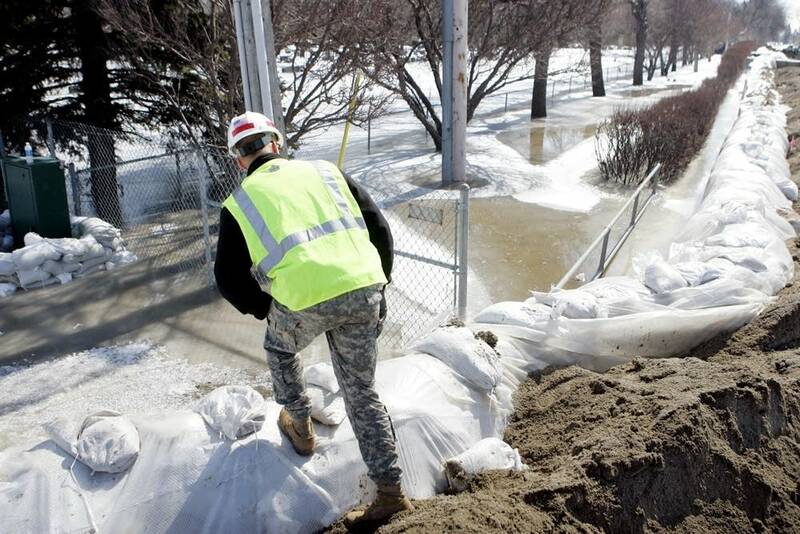 Such efforts were playing out across Fargo-Moorhead after a week in which residents tirelessly worked to fill sandbags and build up the miles of levees protecting the city. Residents were asked to look for signs that dikes may be taking on water and call authorities if they see a problem. Tony Guck joined him halfway. Each felt a special stake in the dike they helped build. "If we don't protect this, it's gonna get us. It's basically for our own security," said Guck, 42. "I'm just planning on coming out every six hours and walking it." The flooding has forced hundreds of residents in the area from their homes, and submerged basements and ground floors in an untold number of houses along the river. 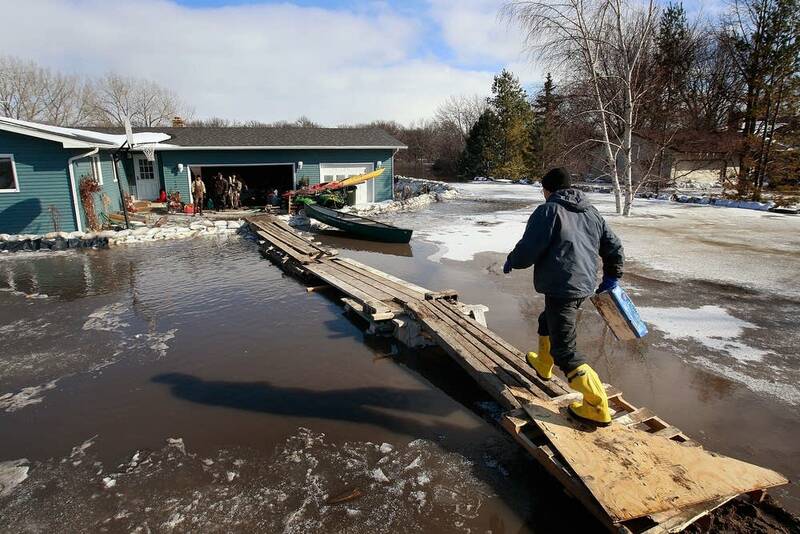 Emergency crews in boats had to rescue 150 people from their homes in Minnesota, while about 20 percent of households in Moorhead have been urged to leave. The flooding was brought on by heavier-than-average winter snows, spring rains and a rapid thaw of the snowpack that sent the Red River to record-high levels. city. A winter storm was predicted to hit North Dakota early next week, although the worst of the snow is expected to dissipate by the time the weather reaches Fargo. Still, wind from the storm could cause 2-foot waves that could send some water over the top of dikes, said Dave Kellenbenz, a meteorologist with the National Weather Service. "That's something we're going to have to watch closely as we move into next week," he said. The variation in flood forecasts was a rollercoaster throughout the week, with the projection edging upward twice before being lowered Saturday. Walaker opened a briefing earlier in the day by apologizing for criticizing the weather service. Greg Gust, a warning coordination meteorologist for the weather service, said the predictions are complex. They come from round-the-clock work by hundreds of scientists, engineers and other experts. Some of those people brave the river for measurements of volume, flow and temperatures. They also use computer models for mathematical and statistical analyses. But even with improved forecasting methods, the river's record levels and the volatile temperatures don't allow anyone to be certain, and the National Weather Service continued to hedge its prediction Saturday. "The relative uncertainty in forecast models remain and the river will continue to behave in ways never before seen," the weather service said. The main focus for the area will be on whether the long line of levees will be able to hold up against the floodwaters -- regardless of their level. Engineers say that any time water is pressed up against a levee for a considerable period of time, there is a risk of catastrophic flooding. "The saturation usually becomes the enemy of a levy over time. It can cause the embankment to be less stable and slide," said Jud Kneuvean, chief of emergency management for the U.S. Army Corps of Engineers in Kansas City. 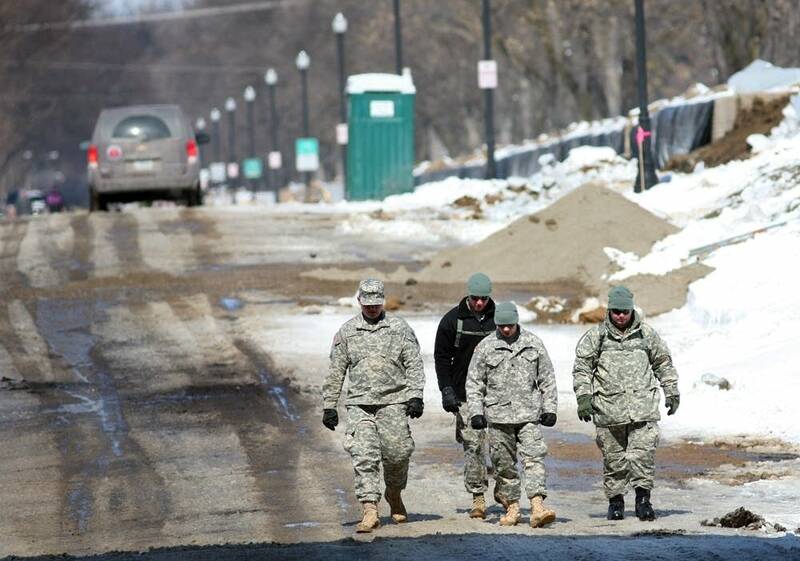 Officials said they were increasing the number of National Guard troops from 1,700 to 1,850, and bringing in hundreds of large bags that hold a ton of sand and could be dropped by helicopter into breaks in the levees. Predator drones began flying overhead Saturday morning, providing military-style surveillance of the situation and allowing authorities to react quickly if flooding worsens. President Barack Obama assured the nation Saturday he was keeping close watch on the floods and putting the government's full weight behind efforts to prevent disaster. Even though evacuations were ordered for thousands of people in Fargo and Moorhead, some residents decided to stay behind. 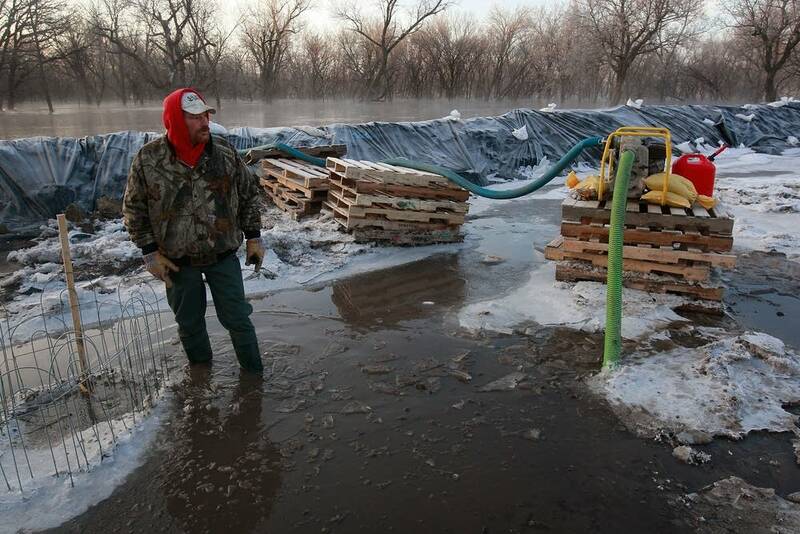 "Right now we're confident, but if the dikes break we'll have people standing on their roofs," said Clay County, Minn., Sheriff Bill Bergquist. Word of the river's possible retreat couldn't come at a better time for Jim Sundahl, 91, whose Moorhead yard has already been swallowed up by floodwaters. He has been waging a furious battle to keep the waters from his home, where he was born. "I'm happy about it, I'll tell you that. 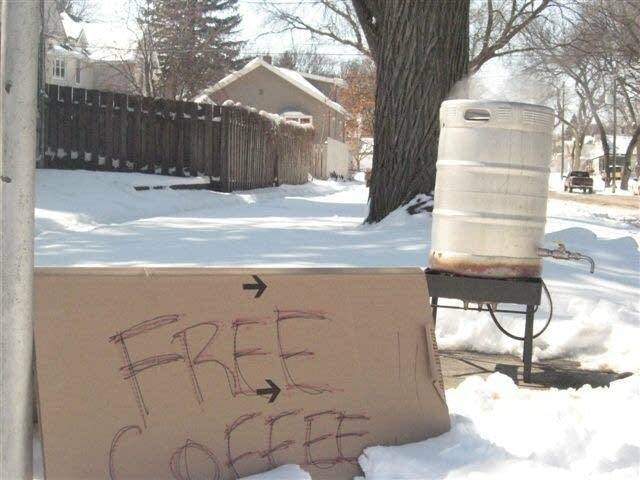 But it won't do us any good for four or five days."